We want to put into production a horrible party game for the horrible adults of Frome. Those without a dark sense of humour, look away. With the extra money, we'll be able to add one extra 'dark' card and two extra 'light' cards inside every pack. We'll also upgrade the cardstock to "Sure Slip Air", which has a glossy textured finish often used by professional magicians for all our backers too. Thank you for your support. Remember that backing this project will be the only time to get your hands on this game. Cards Against Fromanity will NOT be available in shops afterwards. Thanks for checking out our crowdfunder! Remember to choose a reward when you pledge rather than the 'Just donate' buttons. 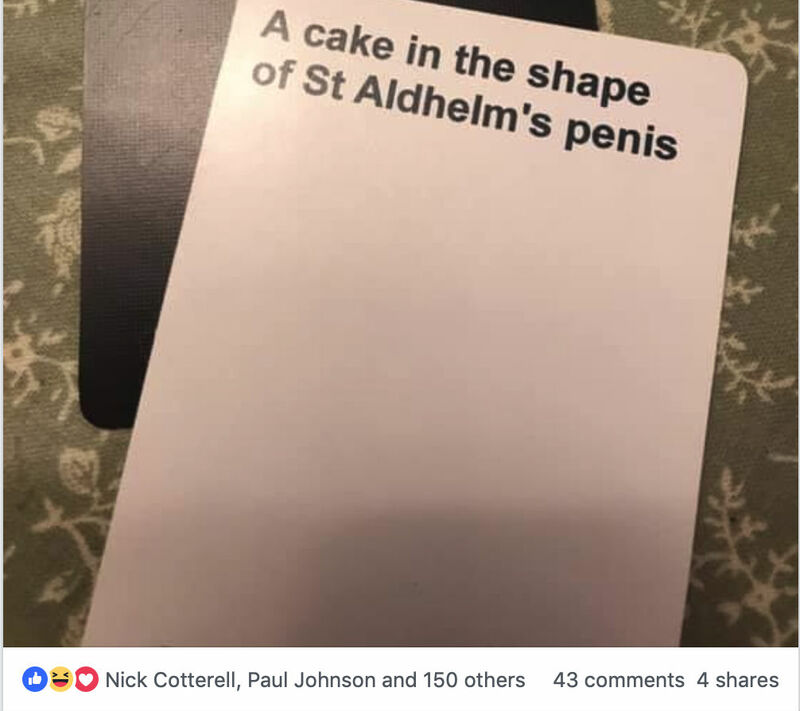 'Cards Against Fromanity' is an adult themed party game for 4+ players based around the traditional game of Apples to Apples and Blankety Blank. There are no fixed rules but generally, a 'dark' card is played and read out by one player, the other players select a 'light' card in response and whichever card is deemed the funniest/rudest/most inappropriate is the winner of that round. Games usually last for 30-90 minutes but you can play for as short or long as you like. Images depict v1.0 prototype. Final version appearance will differ. Well, it's certainly not for children. We recommend players be 18+. Games are best played amongst friends, therefore, avoiding embarrassing moments when playing with family but there's no reason why you can't play it with them too. In fact, the original 'Cards Against Fromanity' (v1.0) has probably been played more with family at Christmas time than it has with friends. Frome residents are likely to understand more of the jokes and references than those from further afield. Those from the city might find it offensive but we won't stop you from backing this project. It'll just cost more to ship to you. 'Cards Against Fromanity' was originally conceptualised about 5 years ago as a localised unofficial expansion pack for the popular game 'Cards Against Humanity' (which we are NOT affiliated with). At the moment only one copy of this game is in existence which contains 36 black cards and 36 white cards. After images were shared on social media of this game on New Years 2018/19, interest from others wishing to own their own copy started to build. We want to expand the deck to double the current number of cards to over 150 so that it can be fully played on its own. It will still be possible to be mixed in with 'Cards Against Humanity' for enhanced gameplay/extra rudeness. Some of the current cards contain too many "in-jokes" and will need changing/replacing, other references are a little dated (RIP 'Frome Charisma Twirlers'), but we already have more than enough new warped ideas to put this together. If we can reach our goal we will be able to put in a small run of these cards to be professionally printed onto "Heretic" poker-sized cards (63x88mm) and provide a neat tuck box to keep them secure in. Heretic 305gsm is a layered playing card material produced by putting two sheets of card together and laminating them into one sheet with a core of black glue in between. The laminate makes the playing card much stronger and more durable than normal paper and card and the black glue in the middle makes sure there is no possibility of any show through. This playing card material has a smooth finish and is a standard playing card thickness. In order to make this project viable there is a floor for orders, otherwise, the costs per pack to print plus the commission fees to Crowdfunder.co.uk and the payment processor will be prohibitively high. We have set our goal at £800 because we think that's a break-even point. The original prototype cost us around £25 to make (plus delivery) and is only half the size of the proposed full game! With economies of scale, we think we can get the cost down to £20 for a pack. We think this is achievable and comparable in cost to three packs of regular playing cards. What will the money go on? From each £20 pack, crowdfunder.co.uk take away ~£1.50 in fees and commission. The vast majority of the money will then be spent on printing and producing the cards and box with a small amount needed for printing proofs and administration. We want to support British business by manufacturing the cards here in the UK. This isn't designed as a moneymaker for us which is why we are asking for extra money for delivery if required. This is just to cover the costs of postage and packaging. We're just two Fromies, not Amazon Prime. In the unlikely event that this project is a runaway success, we'll go to Hawaii and send everyone a postcard. Crowdfunder are charging us a reduced fee for this project and so they will automatically add on a 15% "tip" on the checkout page for you. However, this is entirely optional and helps go towards the running of crowdfunder.co.uk and does not go towards the 'Cards Against Fromanity' project. You can use the drop-down to change the tip to 'other amount' and 0 if you don't want to pay this. We won't frown on you for this choice. For you, as a backer on crowdfunder.co.uk, there aren't really many risks. The game is already designed, and we're putting the final touches to the box artwork now. We have already been in discussion with a British printing company who have provided some quotations per pack. If we don't reach the target then it won't be cost effective to put into production and therefore you won't be charged. The cards themselves will remain the same dimensions and will still be able to be played alongside CAH if you choose to do so. Max out the box by adding one extra 'dark' card and two extra 'light' cards inside every pack. Upgrade the cardstock to "Sure Slip Air" (which has a glossy "linen" finish similar to Bicycle Cards often used by professional magicians). Cards Against Fromanity will not be available in shops. Backing this crowdfunder might be your only opportunity to get your hands on this game. It is unlikely that it will be possible for us to print a second run of these cards so make sure you get in early as once the campaign closes the ability to add extra copies will be locked. We will keep our backers updated along this journey. This may include news posts of card designs and cardstock samples. We'll let you know how far along we are in the manufacturing process with updates on estimated delivery dates. A single pack of Cards Against Fromanity in a box. Free delivery to Frome addresses. Add £3 as an additional donation for shipping beyond our wonderful town. If you live in London add an additional £5... you can afford it. A single pack of Cards Against Fromanity in a box plus a special limited edition piece of Frome "artwork" from the creators, signed and numbered. Free delivery to Frome addresses. Add £3 as an additional donation for shipping beyond our wonderful town. If you live in London add an additional £5... you can afford it. Three packs of Cards Against Fromanity for you and your fellow horrible friends. Save a whopping £1 per pack, put it towards a pint down the George. Free delivery to Frome addresses. Add £3 as an additional donation for shipping beyond our wonderful town. You'll get a unique opportunity to have your own suggestion of a white card immortalised inside every single pack of Cards Against Fromanity. You could choose to simply have your name, or perhaps there's a particular monument in Frome you want to be included. We'll work with you to agree on a special unique card. You'll get 2 x packs as well and we'll even toss in free delivery to anywhere in the UK as special thanks.